Michel Bauwens: Mapping is important to the transition towards a more ecologically-balanced and socially-just commons-centric society, as it brings visibility and conscious awareness to the great diversity of initiatives taking place, and can also be a community-building tool. 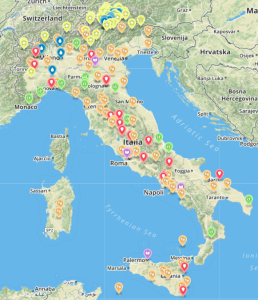 Here is a recent and very professionally undertaken mapping effort for the Italian commons, undertaken by our friends at LabGov. Giulia Spinaci: Commons have turned to be notorious only in recent times, but since they have timidly appeared, there has been literally an explosion of articles, studies and experiments of governance of the commons on field. When a new phenomenon is taken into consideration, usually, one of the first things to do is its analysis: of its characteristics, of the possible implications and, obviously, its geographical distribution. Since ancient times, the explanatory power of maps has always been extremely helpful in both academic and professional sectors, because of the immediacy of the images in transmitting a message. The daily routine does not always allow to be aware of what surrounds us and sometimes, we need active and passionate citizens to remind us of it. This is even truer when it comes to the commons. In this sense, a map might be even more powerful than usual, since it helps displaying the richness of a country in terms of places, monuments, traditions and experiments of governance of the commons. Across Europe and the world, many countries already assimilated this lesson and a lot of associations and organizations produced wonderful maps, offering a glimpse of their variegated national heritage. The case of “Mapping the Commons.net” is exemplary, because of the transnational nature of the investigation. Through a series of workshops and after a thorough analysis of the parameters to be considered and of the commons to be included, this project elaborated a total of six maps of the commons in as many cities in the world: Athens, Istanbul, Rio De Janeiro, Sao Paulo, Belo Horizonte and Quito. The philosophical and theoretical work behind these maps is huge. The map represents the ultimate effort of a sequential process that starts from the definition of the word “common” and passes through the study of the cultural and historical background of each city. In the end, “Mapping the Commons.net” won the Elinor Ostrom Award for research and social intervention linked to the Commons, on the category “Conceptual Approaches on the commons”: a formal recognition for this extraordinary work. When it comes to Italy, it is a different story. A widespread culture on the commons has developed later than the other European countries and generally, than the rest of the world. Consequently, mapping the Italian commons is only a recent achievement. The attempt made by Zappata Romana is noteworthy, but limited in space (it covers only the city of Rome) and only green spaces are taken into consideration. Another map is the one provided by UNESCO, which on the one hand has the virtue of listing intangible benefits (local traditions), while on the other it obviously lacks a comprehensive classification of all the on-field experiments of governance, by marking only the artistic and archeological sites. 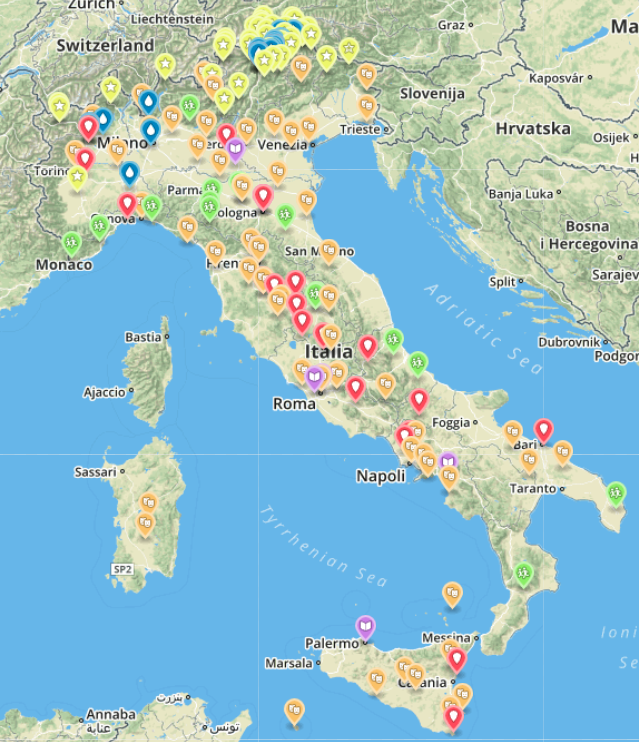 We might enumerate all the mapping attempts in Italy. Still, there is not an exhaustive map of the commons and maybe there will never be, given the great variety of the commons. With the willingness of bridging the gap, LabGov’s latest efforts dealt with this: mapping the Italian urban and natural commons, both the material and the intangible ones, also with an insight of the consolidated governance approaches and of the ongoing experiments on field. Let us start with the definition of the commons: commons are goods, tangible, intangible and digital, that citizens and the Administration, also through participative and deliberative procedures, recognize to be functional to the individual and collective wellbeing, activating themselves towards them pursuant to article 118, par. 4, of the Italian Constitution, to share the responsibility with the Administration to care or regenerate them in order to improve their public use That being stated, it has been quite easy making a list of the numerous (almost infinite) commons in Italy. The map distinguishes the various categories with different marks and the classification includes the UNESCO material and intangible sites, the cooperative communities, the consumer cooperatives (water and electricity), but it also offers an updated list of the cities that approved the Bologna Regulation and of the ongoing projects of LabGov. The spatial distribution is homogeneous, even if the consumer cooperatives are concentrated in Northern Italy, for obvious physical characteristics, since they deal with water resources. Being the project ongoing, the map will never be definitive. Still, it preserves the evocative power typical of images, through the transmission of a message of cooperation in the care and regeneration of the commons. How solid is Tim Berners-Lee’s plan to redecentralize the web? ← How solid is Tim Berners-Lee’s plan to redecentralize the web?